Olivet Institute of Technology (OIT) students participated in the Search Engine Strategies conference held at The Moscone West Convention Center in downtown San Francisco. 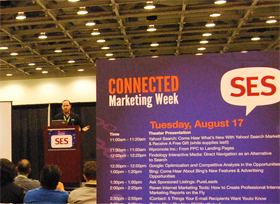 SES is the leading search and social marketing event in the country. Sessions cover PPC management, keyword research, SEO, social media, local mobile, link building, duplicate content, multiple site issues, video optimization, site optimization, and usability. OIT students learned new methods in research for producing more optimized websites and platforms for online marketing. The connection of technology and business are forming through projects and seminars such as the SES event. This conference shows students not only the newest technologies of search marketing, but also fresh ideas and tactics utilized in today’s search marketing media. OIT students also attended the Search Engine Strategies Expo’s various seminars and lectures. Through seeing and experiencing the technologies on display, students can contribute the newly acquired information towards ministries and businesses.